My apologies for the late posting. My modem died early this afternoon, and my wife had the car at work. All is well now. As might be expected, there’s a noticeable lack of music on Thursday. Happily, however, there are a number of worthwhile events for your entertainment on Wednesday and throughout the rest of the weekend. As we enter a happy season, yet one that eventually brings to mind the questions “did you make it through?” and “did you survive?” it may do us well to remember that some folks don’t have the worries of shopping lists, enduring crowds for Black Friday or the difficult choice of whose family to visit for the holidays. Check out the work of Listening House in Saint Paul, and St. Stephen’s Shelter in Minneapolis, two of the many organizations working with the homeless population of our towns. Note also that there are a few fundraisers for food shelves listed this week. Have a happy Thanksgiving. Enormous Quartet @ Cafe Maude, Minneapolis. 7pm – 10pm (No Cover) The Enormous Quartet is led by Chris Bates, bass; Chris Thomson, sax; Park Evans, guitar; and Joey Van Phillips, drums. This is a group whose members have played together many times in various combinations, creating an easy rapport which results in outstanding music. Geoff Bouchier Trio @ Jazz Central, Minneapolis. 8:30pm – 10:30pm. ($10 Suggested Donation) Bouchier is a guitarist who draws from R&B, funk, and jazz in playing music that ranges from the Great American Songbook to pop of the past 40 or 50 years. He’ll be accompanied by Doug White, bass, and Mac Santiago, drums. Davina & The Vagabonds @ The Dakota, Minneapolis. 7pm ($15) If you are looking for jazz on Thursday night, Davina just might be the only game in town, though it’s a game you’d likely enjoy no matter what the date. If you aren’t napping, watching football, walking off dinner, or engaged in other family pursuits, you can shake off your tryptophan to Davina’s powerhouse vocals and modernized old-time jazz and blues. Davu Seru Trio @ the Black Dog Coffee and Wine Bar, Saint Paul. 8:30pm ($5 – $20 suggested Donation) The Black Dog has become the new place to see resident jazz musicians, such as this talented trio. Drummer/percussionist Seru will be joined by Chris Bates, bass; and Steve Kenny, flumpet. Graydon Peterson Quartet @ Jazz Central, Minneapolis. 7:30pm – 9:30pm ($10 Suggested Donation) Peterson is an A-list bass player in town, providing a strong and melodic rhythmic sense to any number of groups. Here he steps out as leader and composer with Adam Meckler, trumpet; Vincent Rose, guitar; and Adrian Suarez on drums. Tony London Trio @ Parma 8200, Bloomington. 7:30 – 10:30pm (No Cover) London is a crooner in the Sinatra/Martin vein, nicely interpreting standards from the Great American Songbook while you enjoy the bar food and drinks at this restaurant/bar in an office tower. Trumpeter Zack Lozier will be part of his trio. Here’s an example of his art. Gypsy Mania Hot Club Quartet @ The White Bear Unitarian Universalist Church, 328 Maple Street, Mahtomedi. 7:30pm ($15, $20, $25) Bringing us a mix of traditional Roma music and acoustic swing jazz, The Gypsy Mania Quartet taps into the jazz traditions of Paris in the early 1930s. The group consists of some of the best players in town: Gary Shulte, violin; Matt Peterson, bass; Glen Helgeson, and Reynold Philipsek, guitars. Emerson Hunton Quintet @ Jazz Central, Minneapolis. 8pm – 10pm. This is a bit of a homecoming for Emerson, a young drummer now in his third year of studies at Oberlin Conservatory. He played in the Dakota Combo in 2010-2011, and graduated from South High in 2012. He’s bringing along schoolmates Nathan Rice on sax and Noah Gershwin on guitar, and adding Jake Baldwin on trumpet, and former mentor Adam Linz on bass. Courageous Endeavors @ Dakota Late Night, Minneapolis. 11:30pm ($5) Courageous Endeavors is Nelson Devereaux, saxophone; Joe Strachan, Rhodes and piano; and Miguel Hurtado on drums. I don’t know if they’ve gotten a replacement for Brian Courage on bass, but they are proving to be inventive and melodic in their approach to originals and jazz standards. Zack Lozier @Jazz Central, Minneapolis. 8;30pm ($10 Suggested Donation) Zack has been a featured trumpet player in the area for some time now, playing and touring with a number of groups, including The Jack Brass Band, Davina & the Vagabonds, Chris Bates’ Red5, and Doc Severinson. Here’s a chance to see him in the casual setting, playing new material. Joey DeFrancesco Trio @ The Dakota, Minneapolis. 7pm ($30), 9pm ($20) DeFrancesco is probably the best B-3 player out there these days. The Grammy-nominated player is no slouch on trumpet either, and will sometimes play the trumpet while still using the keyboards and foot pedals of the B-3. Jazz at Lincoln Center Orchestra w/Wynton Marsalis @ Orchestra Hall, Minneapolis. 7:30pm ($25 – $96) Trumpeter Marsalis has been a lightning rod for many in the jazz community, but there’s no mistaking his talent and technique. 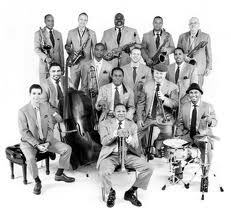 The Lincoln Center Jazz Orchestra, which he directs, consists of the best of the best. This concert is further enhanced with the appearance of Cecile McLorin Salvant, who mightily impressed everyone when she sang at the Dakota last Spring. Nash, Printup, & Gardner and the Atrium Jazz Ensemble @ Orchestra Hall Atrium, Minneapolis. 10pm??? ($50) Pianist Jeremy Walker & the folks at Orchestra Hall have come up with a new four-concert jazz series which will occur after shows in the main hall. Walker, together with bassist Anthony Cox and drummer JT Bates are billed as the Atrium Jazz ensemble, providing the rhythm section for visiting artists, in this case, Ted Nash, sax; Marcus Printup, trumpet; and Vincent Gardner, trombone. All three are members of the Jazz at Lincoln Center Orchestra, which will be playing the main hall earlier in the evening (see above). Wynton Marsalis will make opening remarks. I’ll have Jeremy and Anthony Cox on my show on Saturday, the 29th. Nikki & the Rue-Mates on KFAI and @ The 331 Club, Minneapolis. 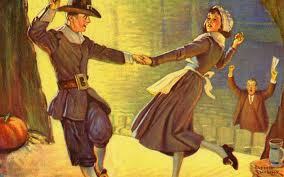 5pm (90.3 & 106.7FM), 7pm (331 Club – Tip Jar) It’s become an annual beginning to the Thanksgiving weekend. Nikki & the guys play Harold’s House Party and head over to the 331 Club where a packed house dances when they can, but always enjoys Nikki’s bell-like vocals, and Rich Rue’s searing slide guitar. 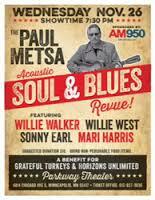 Paul Metsa’s Acoustic Soul & Blues Revue @ The Parkway Theater, Minneapolis. 7:30pm ($10 + non-perishable food item) Metsa, the guitarist/songwriter/author/music impresario, has come up with a great show to raise funds for a couple of organizations that feed the hungry – Grateful Turkeys and Horizons Unlimited. There will be a distinctly New Orleans vibe when vocalist Willie West takes the stage, while Willie Walker provides some Memphis grit. Rounding out the evening’s fun will be Mari Harris, an amazing gospel singer, and Metsa’s virtuoso harp-mate Sonny Earl. Thanksgiving It Back @ The Eagles Club #34, Minneapoils. 7:30pm – 11pm ($10, or $5 with canned good) Here’s another acoustic/rootsy way to support local food shelves. Daddy Squeeze, Jack Klatt, the Hampton Rounders, and the Roe Family Band will all be performing in a benefit for Second Harvest Food Shelf. Corpse Reviver @ Bedlam Lowertown, Saint Paul. 9:30pm ($10) Corpse Reviver is the trio of Mikkel Beckman, washboard & percussion; Jillian Rae, fiddle & vocals; and Adam Kiesling, guitar & banjo. They specialize in “old, weird America,” performing songs from Harry Smith’s legendary 1952 compilation, Anthology of American Folk Music. Don’t expect Peter Paul & Mary. This is music from mostly unknown and almost forgotten artists such as Colley Jones, Uncle Eck Dunford, and Buell Kazee, to name a few. Here’s a chance for East Metro folks to hear them without going to the 331 Club where they play with some regularity. With Sister Species opening and Dave Hoeneck of Hymies spinning. Papa John Kolstad @ The Nicollet Cafe, Minneapolis. 7pm – 10pm ($3) Papa John and friends, plus one of his students, check out the stage at the Nicollet. Papa John, playing 6 & 12 string guitar, will be joined by Sam Fiske on Fat New Orleans Trumpet; Zane Palmer, Jazz Guitar; and Bill Grenke, Bass. Vocalist Myra Burnette will be a special guest, singing blues, swing, and jazz. There’s a bit of a dance floor at the Nicollet, favored by swing dancers, who will have no trouble twirling and boppin’ to the music of Papa John and company. Lisa Wenger CD Release w/Bruce McCabe @ Famous Dave’s, Minneapoils. 9pm ($5) Blues singer Wenger is releasing a new CD, Simple As That, which she made with the help of a number of friends, in the blues community, including such stalwarts as Bruce McCabe, Jeremy Johnson, Andra Lee Suchy and Billy Larson. There are more, to be sure, but the aforementioned will be with her tonight. Opening is that dynamic blues duo, Kildahl and Vonderharr. Here’s Lisa doing a slower number. Astronauts of Rhythm and Sound @ Dakota Late Night, Minneapolis. 11:30pm ($5) Former members of the Hillbilly Voodoo Dolls, Real-Phonic Radio Hour, Curtiss A, and Certain General create swamp country blues and truck driving music, with Ray Bernard on vocals. Patty & the Buttons CD Release Party @ The Heights Theater, Columbia Heights. 1pm ($20) Button accordionist Patrick Harrison and his swinging cohorts in the Buttons are releasing their second CD, Mercury Blues, and they are doing it up with panache. This Family-Friendly event is being billed as a “Spectacular” and it may well be one. Besides the old-timey yet modern music from Patty & the band, the show features some silent film shorts, music performed on the 16 pipe Wurlitzer organ, a duet set from Davina Sowers and Zack Lozier, and more. Attendees are encouraged to wear 1920s attire and leave their phones at home. Admission includes a copy of the new album. Nachito Herrera Trio @ The Dakota, Minneapolis. 7pm ($15) The blazing piano player is a force to be reckoned with. His huge show at the Ordway this Fall showed his mastery over classical, Latin, and jazz genres. Tonight Herrera is back to just a trio and his daughter Mirdalys, who is maturing into a fine singer, but be assured, the power of his playing will not be diminished. Opening of A Christmas Story: The Musical @ The Ordway Theater, Saint Paul. 7:30 tonight. Times vary during its run, through December 28. ($36 – $110) Like many other folks, I find the original movie on which this is based to be charming, to say the least. Ralphie wants that perfect Christmas present – a Red Ryder BB Gun, and Jean Shepard’s story about that quest reveals the wonder and innocence of a time when a triple dare among elementary schoolers just couldn’t be ignored. BTW, a number of Twin Cities artists are involved in this production of the Tony-winning show. The Pines @ The Cedar Cultural Center, Minneapolis. 8pm ($25) David Huckfelt and Benson Ramsey front an indie-rock/Americana group that blossomed from a duo to a full band once they arrived in Minneapolis from Iowa. 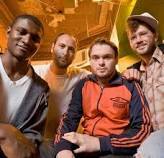 The Pines’ 2007 album on Red House, Sparrows in the Bell was named one of the top roots releases by Q magazine, and then they wowed crowds at 2008’s South by Southwest, gaining them a growing national audience. They’ve just returned from a 25 city tour and are ready to play for the home town crowd once again. Poet/Activist/Recording artist John Trudell opens. Lucinda Williams @ First Avenue, Minneapolis. 8pm($30) I’m not sure if Williams makes beautiful music depressing, or depressing music beautiful. Her voice conveys the ache of a broken heart like few other singers. There is no doubt, however, about her artistry and her way with words. She’s a big favorite of the Twin Cities, and will likely fill both nights at downtown’s rock palace. With the Kenneth Brian Band opening. How did Thanksgiving get here so quickly? Well, there’s much going on, though Thursday is a little light, as might be expected. There’s plenty of opportunities to dance off the calories over the weekend, so whether you’re having Turkey, Duck, Turducken, or Veggies, have a good Thanksgiving. Body Omara @ Cafe Maude, Minneapolis. 7:30pm. (Free) This trio – Joseph Damman guitar; Tom Reichert, bass; and Davu Seru on percussion – create original music that evokes the desert blues of Mali, and includes some elements of American folk and jazz music. The south Minneapolis neighborhood bistro provides the flavors and cocktails that will help you get your weekend started. Zacc Harris Group @ Cafe Maude at Loring, Minneapolis. 9pm (no cover) The ever-busy guitarist Zacc Harris brings his group to the Loring Park neighborhood bar. With Bryan Nichols on piano; and Chris and JT Bates on bass and drums. While some of his other groups are more collaborative in nature, this group performs Harris’ tunes, along with a tasty standard or two. Here’s a taste of what they sound (and look) like. Dave King Trucking Company @ The Artists’ Quarter, Saint Paul. 9pm ($15) Drummer Dave King is in enough groups to have his own festival, which actually occurred at the Walker a year or so ago. This group was created especially for that event, and it’s proven to be more than a one-off effort. With Brandon Wozniak, sax; Adam Linz, bass; and Erik Fratzke, guitar. They recently released a CD which got positive reviews in the New York Times. Tony London @ The Eagles Club #34, Minneapolis. 8pm ($5?) London is a talented singer who reminds me of some of the classic baritones of the 50s. 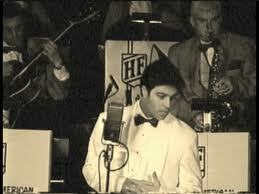 He can swing like Sinatra, and handle a ballad like Vic Damone. I expect that the excellent dance floor at the Eagles Club will be filled. Graydon Peterson Quartet @ The Icehouse, Minneapolis. 9:30pm ($5) JT’s Jazz Implosion brings Graydon and his group to the fore. Peterson is known as a stellar bassist, and provides a firm foundation for a number of groups around town. Tonight he’s leading his own group, playing his own songs. Other members of the group are Adam Meckler, trumpet; Vinnie Rose, guitar; and Adrian Suarez, drums. Karrin Allyson @ The Dakota, Minneapolis. 7pm ($40), 9pm ($25) The pianist/vocalist has a bakers dozen of well-received albums to her credit. Her warm voice and subtle ways with a melody have won her fans around the world and a couple of grammy nominations, to boot. She lived in the Twin Cities for a while in the nineties, and it’s always a pleasure to have her back. Adam Meckler Orchestra @ Jazz Central, Minneapoils 8:30pm (Donation) Exciting music for a large band – 17 members, including some of the area’s finest players. Meckler is proving to be as talented at composition and arranging as he is on the trumpet. Nikki & Rue-Mates @ KFAI & 331 Club, Minneapolis. 5pm (90.3 & 106.7FM) and 7pm (331 Club – tip jar) Clarion-voiced Nikki, along with her talented band-mates play their annual pre-Thanksgiving gig. Listen at 5pm and head over to the 331 Club. Davina & Vagabonds @ the Dakota, Minneapolis. 7pm ($15) Even if you’re sitting down, you will likely work off some calories listening to Davina and the guys. 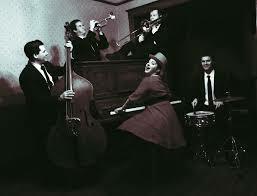 Her mixture of classic New Orleans Jazz, Blues, and roots will have you hoopin’ hollerin’ and jumpin’ in your seats. A few folks might even find room to dance. Deano & The Dinosaurs @ Merlin’s Rest, Minneapolis. 8:30 – Midnight (Tip jar) Guitarists Dean Mikkelson leads this aggregation, featuring fellow guitarist Dean Harrington, bassist Matt Senjum, and Del Gallagher on drums. Tasty music for the end of a taste-filled day. Bring an ID if you want to drink alcohol. Hipshaker @ the Kitty Kat Club, Minneapolis. 9pm ($5) Now you can really dance some calories off as Tarik Thornton and Mark Trehus guest, spinning funk and soul 45s along with DJ Brian. An Evening with Ben Kyle & Romantica @ The Ritz Theater, NE Minneapolis. 7:30pm ($12) Kyle is the leader of the alt-countryish Romantica. He and the band earned high praise for the 2007 album, America, which showcased Kyle’s writing. Now Kyle has written some songs about his own demons, and the challenges of having a family and a music career. The album was just released, and to celebrate, Kyle is bringing members of the band (who all appeared on some portion of the album) and a few friends to the Ritz. Paul Metsa CD Release @ Electric Fetus and Palmers, Minneapolis. 2pm – 3pm (Fetus) 9pm (Palmers – $3) This Iron Ranger/Twin Citizen is a bar-band veteran who has been there and done that, from sharing the stage with Pete Seeger and Bruce Springsteen, to campaigning with Paul Wellstone, and wrote about it in his memoir, Blue Guitar Highway. Now he’s releasing a 30 track retrospective entitled Blues, Ballads, and Broadsides. 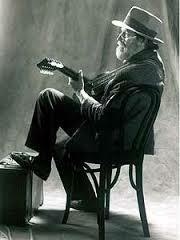 He’ll be reading and playing at the Fetus, and then will be joined by some of his musical friends at Palmers. Greg Carr & the Mixmaster @ The Third Floor, 579 Selby, Saint Paul. 8pm – 11pm. (no cover) Greg has this amazing vintage deejay setup, wherein the Mixmaster has two turntables and three tone-arms. He’ll be spinning 78s, including a bunch of vintage Brazilian music, while you and your friends can partake of ten different tap beers, cocktails, and wine, along with some chocolate. Hot Pants @ The Nomad Club, Minneapolis. 9pm ($5) Another night of dancing to rare funk and soul 45s. City on the Make @ Dakota Late Night, Minneapolis. 11pm ($5) Here’s a group that doesn’t fit into an easy category. Vocalist Mike Massey is more a growler than a singer, and he declaims their songs with a measured ferociousness. The music ranges from blues to rock to hip-hop, and the way the band feeds off each other gives an improvisatory feel to some of their numbers. Malamanya @ The Nomad, Minneapolis. 9pm (Free) Actually, the doors open at 9pm. Music will likely begin around 10pm. Latin dance music that will move even those with two left feet. Jenny Dalton @ The Kitty Kat Club, Minneapolis. (Free) There are three artists on the bill, but Dalton is the only one I know, and I’m not sure when she sings. Nevertheless, her ethereal vocals are worth waiting for. She’s recently released an EP called Blood Folk, that’s inspired by living a simpler life in a small town.